Tank Dynamaze has arrived for Android TV! KurtMaster2D Technical Overview – PLBM Games on KurtMaster2D has arrived! I recently revived my collection of old PalmOS games and ported them to run under Unity3D on multiple platforms. 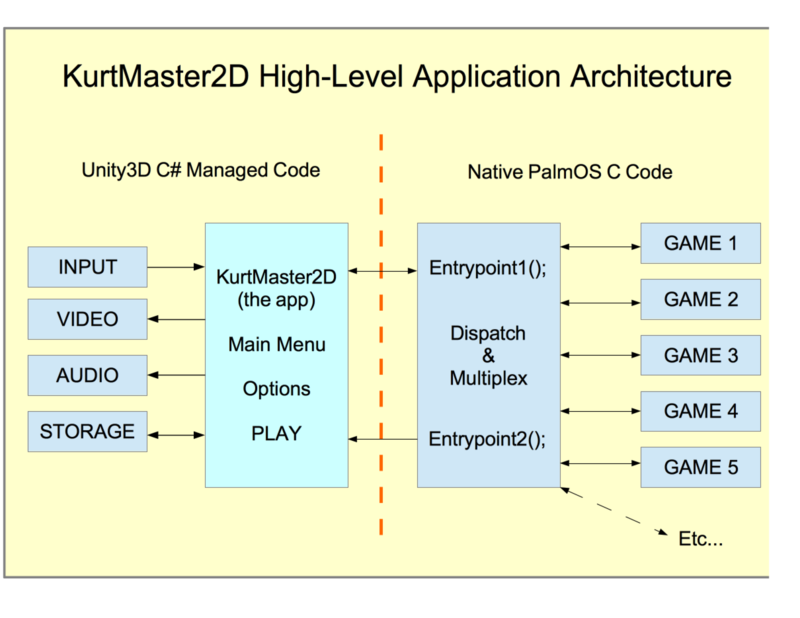 You can check out my KurtMaster2D app for Apple/iOS and/or Android. This is a brief overview of the process of porting the PalmOS native code for running under Unity3D’s managed code environment. My original PalmOS games all shared a common software-rendering 2D graphics library that I wrote. This library started life in January 2000 as 1-bit (black and white) graphics and then was later extended to 4-bit grayscale and finally 8-bit color graphics, when I was porting my games to the color-capable PalmOS handhelds. This commonality made the conversion of all the games into a single library far easier. All games had been maintained and still compiled for PalmOS when I started work on KurtMaster2D. Here were a few of the design goals and guidelines I had in mind when porting my PalmOS games into a modern Unity3D context. 4. Keep as few dependencies and/or bindings between the Unity “wrapper” and the underlying native game library, in order to simplify adding more games, extending the wrapper, etc. – presented the contents of a Unity3D Texture2D at any arbitrary resolution. The games varied in their internal resolution from 160×160 up to 512×384, and not all of them could easily change to a common resolution. Therefore I made the Unity shell able to present any shape surface. Towards achieving Goal #2, I made a dispatching/multiplexing layer that lives “above” all of the individual games and knows about all of the games in the library. Presently there are several dozen games in the library, in various states of completion. This dispatch/multiplex layer is the main agent that Unity interacts with. It is stateful and responds to commands that come through the single “Entrypoint1()” function that Unity calls. After each response, the string returned contains either a simple “ok,” or else the information that was requested by the opcode, supplied as a semicolon-separated string of arbitrary length. In Unity I slice up this returned string in order to receive communications back from the underlying game. At application startup, Unity iterates against the library to discover the names, resolutions and any other relevant app metadata. Unity uses this data to present the main menu and list of available games, as well as to know how each game must be presented and interacted with, what kind of input buttons it needs, etc. Once the user has selected a particular game and presses PLAY, a different subset of commands are issued to the dispatch/multiplex system to startup the game. After the above opcodes have been sent to the native game code, the game will have prepared a single frame of output and made a call to the PalmOS “DrawBitmap” function to present it, which wipes out the previous frame of graphics. to pin the memory in place for the native code to fill with data. This System.IntPtr is passed into Entrypoint2(), which transfers the last frame graphics. Finally Unity marshals the pixels into a Texture2D and then presents it to the user, waits an appropriate amount of time (usually 1/20th of a second) and repeats the main loop. And that is the entire process in a nutshell, a high-level overview of how I brought my PalmOS games back to life under Unity3D in my KurtMaster2D games. Going forward I will be bringing more of the games online (some still have bugs) and making regular updates to the appstores. The games also run under Win32 as well as MacOSX, so I am going to make desktop PC binaries soon as well, once I have a good desktop interface put together in Unity3D.